Norman tries to trust Dr. Edwards, but still worries he might say too much . Also, Norma hires a handyman to fix her stained-glass window who isn’t what he seems; Romero can’t seem to shake Rebecca Howard. It’s all in another week’s worth of secrets and reveals on Bates. Read more in Special Contributor Tracey M.’s recap – David F.
Alex and Norma begin cleaning up her ransacked house. Norma wonders if they should be dusting for prints and whether Bob Paris is involved. Alex knows Bob is swimming with the fishes, and chalks up the break-in to his past involvement with the DEA. With Norman out of her hair, Norma ventures out to the local hardware store, looking for someone to fix her stained glass window. The clerk takes her name and address in case he locates a craftsman. All the while, Dylan and Caleb’s funky, dusty, mountain-wacko buddy, Chick, is in the next aisle wearing his listening ears. Norman is docile and agreeable in session with Dr. Edwards. He recalls that when that his dad died, he stepped up as man of the house. He’s worried about Norma being alone now. No worries, Normie, Mama’s not lonely. Norman asks if he can call Emma to check on her after her lung transplant. Norman calls his mother instead. The call goes to voicemail and Norman leaves a message, saying that he understands why he’s at Pineview, and hopes to get the help he needs. I’m not sure who this Noman is. Why is he suddenly so agreeable? How many personalities are in there, Norman? Norman??? Norman, is That You? Later, Dr. Edwards gets a call from the White Pine Bay police station; there’s no record of Norma Bates doing anything illegal anywhere, ever. No big surprise there. Dylan brings Emma home from the hospital and helps her to her room. He’s careful around her, treating her like she’s fragile. Not fragile at all, she grabs him and kisses him hard. She tells him the doctor recommended she wait 4-6 weeks. Dylan smiles; she actually asked her doctor when she could be intimate with him. Aww! Before heading out, Dylan tells Will about a job interview he has in Seattle the next morning. Will’s happy that Dylan plans to move to Seattle with them. Emma is positively glowing. Dylan has proven himself to be a stand-up guy, despite Norma, Caleb, the weed farming and all. 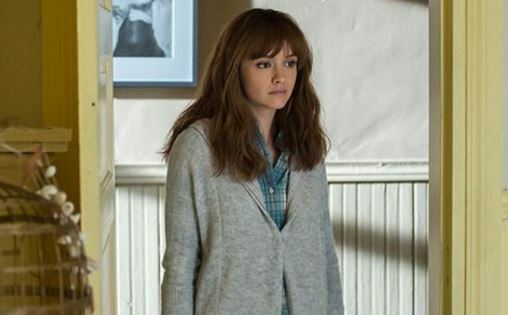 Kudos this week go to Max Thieriot and Olivia Cooke. As Dylan Massett and Emma Decody, they’ve joined the list of my favorite couples. Dylan and Emma are both a bit shy and soft-spoken and are good, decent people. Their relationship grew slowly, but they had great chemistry right away. They’re adorable together. They’re belting out Dylan and Emma’s love story to the rafters, and I hope they get to play it out. Chick, our musty, dusty woodland pal, is ringing Norma’s doorbell. He says he’s the stained glass specialist (and I’m the Tooth Fairy). Norma is slightly put off by his appearance and probably his aroma, too, but lets him in anyway. Chick explains his condition away saying he had an auto wreck avoiding a dog in the road. Ooo’kay. His eyes dart around the room as he speaks. He’s creeping the hell out of me, I’m surprised Norma even let him in. She should be able to spot a kook by now! He says he can restore her window. Julian is back at Pineview, and Norman’s happy to see his buddy. He asks Julian how he’s doing but Julian is catatonic, probably on some heavy-duty meds. His face is still swollen and bruised from their boys’ night out. Good times, good times. Norman’s upset by Julian’s appearance and decides to takes a walk out into the courtyard. Sitting on a wooden bench, Norman spots Norma walking toward him. He’s surprised and overjoyed to see her. He tells her about his sessions with Dr. Edwards. She urges him to say whatever is necessary to be released. But not too much. He promises he will. Problem is, Norma’s not really there. Back at the Decoty house, Dylan is feeling positive after his interview in Seattle. He and Emma are stretched out on her bed, talking. Emma says that she really wants to be with him, but she’s embarrassed by her scars. She lifts her shirt to show him, waiting for him to cringe. Dylan is unfazed and takes his shirt off and shows Emma all of his scars. He finds ways to make her laugh before kissing away her insecurities. Such a sweet moment for the new couple. Norma drives back from town to find Chick waiting for her in the dark, outside the motel. What the hell, you creep?! He rambles on awhile about stained glass repair, then suddenly shifts gears and says that he knows Gunner, Dylan and Caleb. Chick is surprised to hear Norma say that Caleb is her brother. That’s not what he was told when he met them. He’s making Norma uncomfortable, so she makes an excuse to head up to the house. Later, Alex walks in to find Norma playing the piano and singing. She senses she’s not alone and stops playing, embarrassed. Alex sits on the piano bench next to her. He tells her the break-in has been handled. Alex Romero doesn’t fool around; don’t let those paint-brush eyelashes fool you. Norma asks him again if he killed Bob Paris. Alex says he had no choice. He puts his head on Norma’s shoulder and she comforts him. Back in session, Dr. Edwards tells Norman his claim that his mother visited him yesterday isn’t possible. He also lets Norman know his phone call was monitored and he’s not fooling anyone. Norman argues with Dr. Edwards about what is real and what isn’t. Yes, Norman, you are the authority on reality. Norman starts to get angry and starts pacing the floor. Dr. Edwards puts a hand on his shoulder and speaks to him softly to calm him. Norman tells Dr. Edwards how soothing his voice is. (He’s the psycho-whisperer) Norman is morphing into Norma right before the doctor’s eyes. Dr. Edwards knows he’s dealing with Norman’s alter-ego, and addresses “her” accordingly, asking if “she” knows anything about Norman’s problems. Dr. Edwards makes sure to check in on Norman before leaving for the day. He promises Norman that he won’t have to go through his therapy alone. I don’t think Norman is ever “alone”. Chick swings by to see Norma again. He says that his car accident story was a lie. Really? He knows Caleb and Norma are Dylan’s parents. He muses that maybe Caleb raped Norma, or maybe Norma was in love with Caleb. Chick tells Norma how badly Caleb beat him, and that he plans to get even. He says he’s been trying to find Caleb. Norma stares after him as he shuffles away. Where’s Alex when you need him?? ?